Golden Apples: It's Summer Time! Memorial Day, at the end of May heralds summer—but real summer time is bracketed by the July 4th weekend at the beginning, and Labor Day weekend at the end. And this year July has co-operated and started on a Friday making this a real holiday weekend. So hats are finished for now—and the first bottle sock is 3 inches tall. I had sort of planned to knit them 2 at a time... but I wanted to get started—and I just did. While in theory, any left of sock yarn will do—In reality I often like to keep nice bits (solids especially) for trim on other socks—so for bottle sock I am sticking to rejects. The colors are somewhat drab, the spiral pattern, boring. I think I have (I KNOW I HAVE) better left overs—but this yarn was the handiest. And it will do. The pattern is simple enough—cast on 10, increase (10 every other round) till 70 stitches (it look to be the right size!) 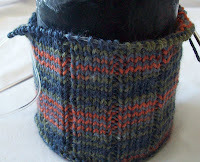 a few round of reverse stocking knit as a 'turn' and then 2 more stitches for an even 72. I'll root around and find another pair of partial balls—or maybe a pair of pairs—and be ready to start again with more bottle socks ASAP! 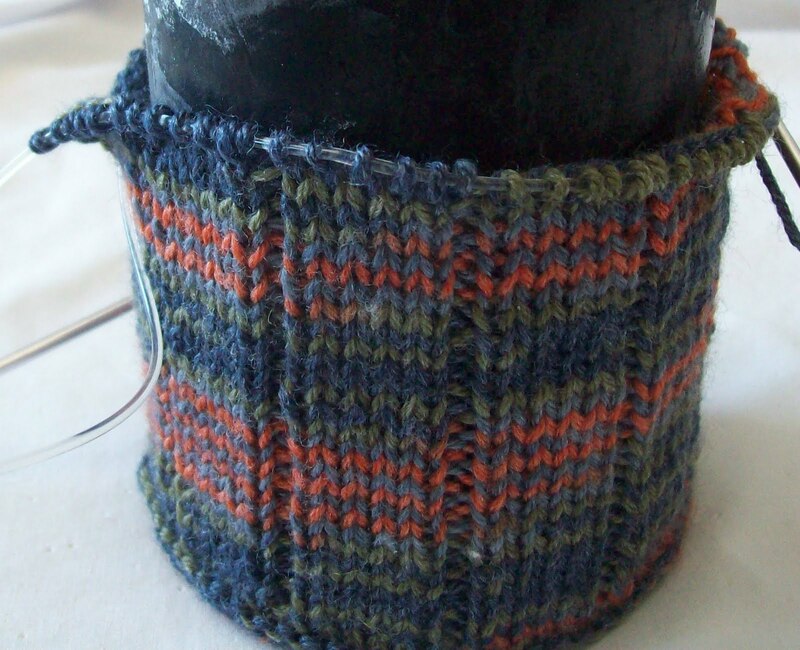 Your bottle sock is a great idea! I'll bet you take it with you to the pool, don't you? This is a great project and thanks for haring it. DH just bought a used bike, one that has a place for a water bottle of this type and I'm so pleased to find your perfect knit cover for it. Thanks! And, Happy Fourth of July, too.